I was in the middle of working on this tank and had to jump up from my bed to rescue my daughter from a nightmare she was having and as I bumped off the bed, my heel landed on top of one of the needles. I heard the crack and cringed at the noise. And behold, a monumental break. I wonder...is it a sign? Should I continue this vest? Maybe my knitting angel wants me to frog this project and just go on to this? or this? 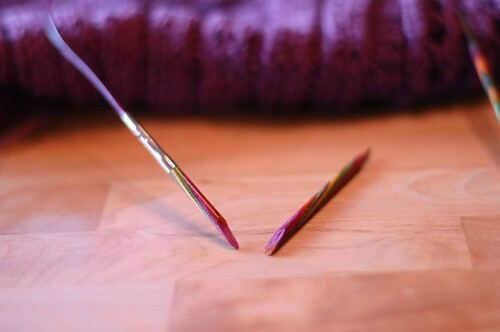 I do plan on getting replacement needles, but now I am rethinking my knitting queue. Such is life, isn't it? That things happen when you don't expect them, and there is no where to go but to revisit that personal queue we have in our hearts. I know, that's sounding really deep, but humor me a little...it's been a long week. Maybe I should just quilt tonight.